Properly respected, engaged and interacting, the diverse many together become a resource for deeper, broader, wiser insight, action and identity as their whole group, community, network, people, humanity. So nurture collective “we the people” consciousness and agency rooted in diversity and learning, not conformity and authority. How do we nurture healthy “we the people” identity, consciousness and agency among the citizenry that’s rooted in diversity and learning rather than conformity, authority, partisan solidarity, majoritarian claims or the mere amalgamation of disconnected citizens? How do we help the people as a whole take effective collective responsibility for public affairs? What would it mean for all the people – or even just all of us – to take to heart the unity that is woven of and empowered by their diversity? “Out of many, one” is America’s national motto which you can find on American money. I only know about it because it is printed on US dollar bills. 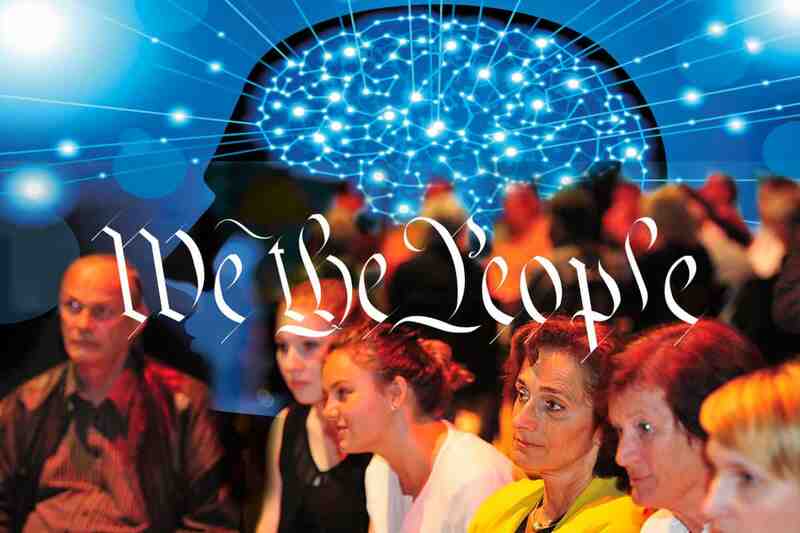 Since we are talking about wise democracy, we do want a “we the people” consciousness. We do want a sense that we have a common nature, direction, purpose, and values. But we want that rooted in our diversity and learning. We are many and that “many” is valuable. Using that diversity – that “manyness” – we can learn new things and generate smarter ways to do things. We don’t want a oneness that is conformity or just following authority. That’s not what democracy is about. A particularly wise democracy doesn’t waste the diversity and its potential. If we make things uniform, we waste the diversity that is there. But diversity can waste itself just by fighting amongst itself. So wise democracy is looking at how we can get a “we the people” consciousness that comes from deepening into greater insight, greater relationship, greater possibilities together. Properly respected, respecting the “other” all the time, properly engaging and interacting, the diverse many become a resource for deeper, broader – wiser – insight and action because everybody’s got a different piece of the puzzle, a different perspective, a different contribution, different resources that they could put into acting together. Somebody has this skill or that skill, and you put the skills together in the right way and you end up being able to get good products and outcomes. So this is a general stance, it is related to many other of these principles and these patterns. But that framing – “Out of many, one” is very useful and handy thing to carry this idea. Human brain cells have a networked nature to them, but out of their networked functioning comes our particular kind of consciousness. They are many and they’re all doing their own thing and they’re doing it in ways that are not all the same: There are diverse brain cells and diverse parts of the brain. There is a sense in which “E pluribus unum” is manifested in our brains in a way that has a collective intelligence sort of connotation. There is a collective intelligence going on inside our heads all the time. Dynamic Facilitation is particularly good at generating “out of many, one” dynamics in a group. Two processes – 35 and CoDigital – are prioritization systems. The first is face-to-face and the other is online. Both use our collective diversity to come up with a shared list of prioritized items. Both involve evaluating match pairs of items and deciding which is more important or better than the other – and doing that over and over with different pairs. They can be used to prioritize whatever kind of thing we are working on. Of course Consensus Process helps make one view out of many views. That’s its whole purpose.